Carefully cut the strawberry calyx (green) off each strawberry in a straight line. This will be the base of your Santa. Cut each strawberry tip off about 1/4 of the way in – this will make each Santa “hat”. Place the hazelnut spread and cream into separate small piping bags. Poke a hole in the centre of the Santa body (a chopstick is good), and fill with hazelnut spread. Place calyx cut end on a serving plate. Carefully top this with a little whipped cream, and pipe on two more hazelnut dots for eyes, and a tiny piece of strawberry for a nose. 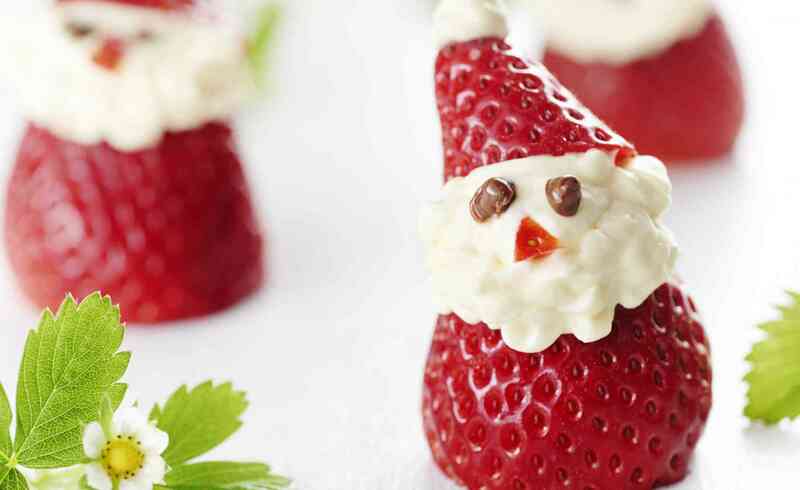 Top with Santa’s “hat” piece of strawberry and finish with a small dot of cream for his pompom. Repeat with all the strawberries and serve.